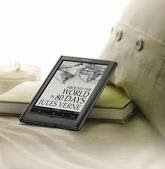 As I’ve mentioned a number of times since my birthday, I’m a huge fan of my Sony eReader Touch (for my initial excited post, click here). I often think that there’s a degree of bookish..not snobbery but something similar..when it comes to those of us who go for ebooks; as though we’re dragging the tradition of reading through the mud. It is with no small amount of excitement that I can proudly say that this week the FIRST featured blogger is LIT ADDICTED BRIT!! Check out the interview here and share the love for all things ‘e’!! If you fancy being a featured blogger, check out her blog and drop her an e-mail!